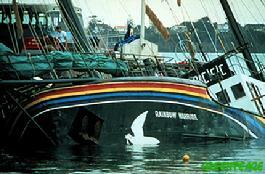 When the Greenpeace ship Rainbow Warrior was blown up shortly before midnight on the night of 10th July 1985 by agents of the French government, in an attempt to foil protests of their nuclear weapons testing in the Pacific, it spawned an international recognition of the Rainbow as a symbol of environmental protesters. The ship's name was inspired by North American Indian prophecy which foretells of a time when human greed will make the Earth sick, and a mythical band of warriors who will descend from a rainbow to save it. Everyone has seen the famous Indalo symbol on countless cars, trucks and houses in Spain, but few Spaniards realise that it is a symbol found over half the planet - otherwise known as Rainbow Warrior or Rainbow Man. Spain's Rainbow Man (Hombre del Arco Iris) gets its name Indalo either from San Indalecio - a 1st Century AD saint who was sent by Rome to evangalise the Iberian Peninsular, or the phrases Indal Eccius (which means Messenger of the Gods in old Iberian) and In Deus (which means According to God in Latin). A Rainbow Warrior or Rainbow Man is known as Un Guerrero de Arco Iris. The Rainbow Man or Rainbow Warrior of North America got its name from native American Indian culture especially that of the Cree, Hopi and Sioux tribes. It features in sacred drawings of the Zuni and Navajo; and for the Indians of the Mojave desert of Arizona, the rainbow is one of the most powerful qualities of the Great Spirit, the creator of all existence. 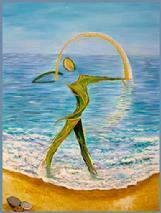 The Yukis of California also believe the rainbow to be part of the Great Spirit. "The Indians will regain their spirit and gather people of all nations, colors and beliefs to join together in the fight to save the Earth as The Rainbow Warriors." "When the Earth is sick, the animals will begin to disappear. When that happens, The Warriors of the Rainbow will come to save them." Chief Seattle (Si'ahl) 19th Century leader. "One day, there will come a time when the earth will be ravaged and polluted, the forests destroyed, the birds will fall from the air, the waters will be blackened, the fish poisoned, and the trees will no longer live. Then, the keepers of the legend, stories, culture, rituals, and myths, and all the ancient tribal customs will restore us to health, making the earth green again. They will be called the Warriors of the Rainbow. '"Eyes of Fire"
In Hawaii, the petroglyphs are ancient rock carvings representing various aspects of daily spiritual life. One of these, known as Rainbow Man has special significance for the Hawaiian people - it is a symbol of the responsibility of each individual to take up the task of protecting the land or the 'aina'. In Ramses II's temple at Abydos in Egypt you will find the courting priestesses of Seti. In Italy, Leonardo da Vinci's Vitruvian Man. In South/Central America, the Mayan, Aztec, Tarascan and Inca races had gods or goddesses of the Rainbow. The symbol also appears in cultures in Africa, Australia and Asia.